READ: Collins, Janet, and Jeffrey P. Koplan. “Health impact assessment: a step toward health in all policies.” Jama 302.3 (2009): 315-317. Instructions: Review social and structural determinants of health and how they apply to communities and health outcomes. Violence: Beyer, Kirsten, Anne Baber Wallis, and L. Kevin Hamberger. “Neighborhood Environment and Intimate Partner Violence: A Systematic Review.” Trauma, violence & abuse 16.1 (2015): 16–47. PMC. Latinx Mental Health & Segregation: Nobles CJ, Valentine SE, Zepeda ED, et al Residential segregation and mental health among Latinos in a nationally representative survey. J Epidemiol Community Health 2017;71:318-323. Food Insecurity & Gender: Martin, Molly A., and Adam Lippert. “Feeding Her Children, but Risking Her Health: The Intersection of Gender, Household Food Insecurity and Obesity.” Social science & medicine (2012): 1754–1764. PMC. Asian American Immigrants and Social Support: Singh, Shipra, Kimberly McBride, and Vivek Kak. “Role of social support in examining acculturative stress and psychological distress among Asian American immigrants and three sub-groups: Results from NLAAS.” Journal of immigrant and minority health 17.6 (2015): 1597-1606. Gentrification: Cole HVS, Garcia Lamarca M, Connolly JJT, et al Are green cities healthy and equitable? Unpacking the relationship between health, green space and gentrification J Epidemiol Community Health 2017;71:1118-1121. This entry was posted in Uncategorized on April 3, 2018 by mspin. GOAL: Explore the idea of aftermath of medical error on an individual provider in terms of both sentinel events and smaller daily “mistakes.” Consider how to channel this distress into productive outlets, for example, through constructive worrying. Context and Instructions: Read article to begin to appreciate the effect medical errors can have on providers and get introduced to a way of thinking of how to support ourselves and colleagues who experience the aftermath of a medical error. GOAL: Gain more familiarity with tool of debriefing especially as it might pertain to the aftermath of an adverse clinical event. Context and Instructions: Read article to learn about the definition of debriefing, the components of debriefing, and special considerations. GOAL: Have access to primary data on the emotional impact of errors on providers. Context and Instructions: Review a survey completed by 3,171 of the 4,990 eligible physicians in internal medicine, pediatrics, family medicine, and surgery (64% response rate) on the emotional impact of errors on practicing physicians. GOAL: Recognize approaches to responding to an adverse event and the impact of adverse events on caregivers. Context and Instruction: This supplementary activity will offer further context on the patient apology, responding to an adverse event, and the impact of adverse events on caregivers as the second victim. This entry was posted in Individuals, Interactions, Interprofessional Education (IPE) & Communication, Professionalism on March 30, 2018 by mspin. This entry was posted in Individuals, Interactions, Interprofessional Education (IPE) & Communication on March 30, 2018 by mspin. 1. Read Cultures of engagement: The organizational foundations of advancing health in immigrant and low-income communities of color. Bloemraad I, Terriquez V. Soc Sci Med. 2016;165:214-222. PMID: 26898114. This article presents an overview of the mechanisms by which community-based organizations can contribute to community well-being. Consider the implications for local communities you have worked in, and think about questions you’d like to ask panel members about their work. This entry was posted in Uncategorized on March 30, 2018 by mspin. 2) Watch video of Carol Gilligan on Moral Development and Care Ethics. 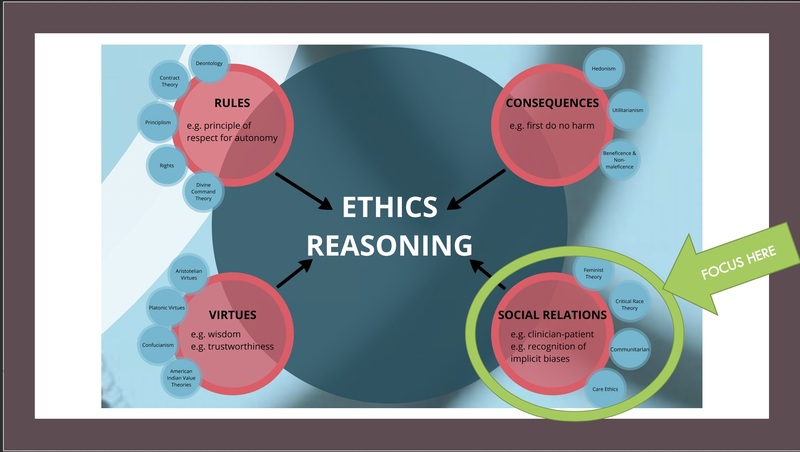 GOAL: Understand the basics of care ethics and how it might apply to the clinical setting. Consider what is different about the approach that Gilligan is suggesting (i.e. a relational or Care Ethics based approach) from what you typically think of in terms of your ethical obligations as physicians. GOAL: Consider what you learned from Gilligan’s video and the above ethics key terms in this complex case of refusal of life sustaining treatment (LST). Consider this is just one instance among a myriad of different clinical-community interactions. It will help us to begin to see the importance and sometimes the difficulty of respecting and valuing different community-based and relationship-based values and beliefs. Have you ever found your own personal and community-based beliefs to be in tension with the norms of the institution of medicine? You can also find substantial research on many diverse communities of Americans here in a “Diversity Toolkit” created by Cleveland Clinic: https://my.clevelandclinic.org/-/scassets/files/org/about/diversity/2016-diversity-toolkit.ashx. This entry was posted in Communities, Ethics on March 30, 2018 by mspin.